Yuzawa is a small town located in the mountainous prefecture of Niigita, Japan and it is a wonderful place to visit throughout the year. Our first trip to Yuzawa was at the beginning of spring however, snow was still falling and the “Japanese Alps” (as they are known) were covered with deep, powdery snow – perfect for a 5 days skiing trip. Whilst the township of Yuzawa is quite small and nondescript, it is nestled at the base of some spectacular mountains and home to four ski resorts. The mountains in Niigita are not as high as the European Alps or the Canadian Rockies but what they lack in height the make up for in snow. Japan is known for its high annual snowfalls and the “powder hound” runs. Getting to Yuzawa from Tokyo is easy. The Max Tanigawa bullet train leaves Tokyo station every 30 minutes and, after a comfortable 90 minute ride, it stops right under the Gala resort (the largest ski resort in the area) – incredible service. This is one of the reasons why the area is so popular with Tokyo’ites. Leave Tokyo around 0700, have breakfast on the train, arrive at the ski hill as it opens (0830) and be skiing by 0900. After a day of skiing you can be back in Tokyo for dinner and a baseball game! Perfect. Given that we planned to ski for three of our five days, we opted to book into a hotel in the township. This allowed us to be on the ski hills when the opened. Our choice of lodging was the New NASPA Otani hotel. Otani is located right at the base of Mount NASPA and you can literally walk from your room to the ski locker and then step outside to the ski lift. After a long day of skiing you can relax in the hot spring fed baths that are a part of the complex. The Japanese know how to live! Cape Town city grows smaller the further our gondola gets from the lower station. We are on our way up to the top of Table Mountain. 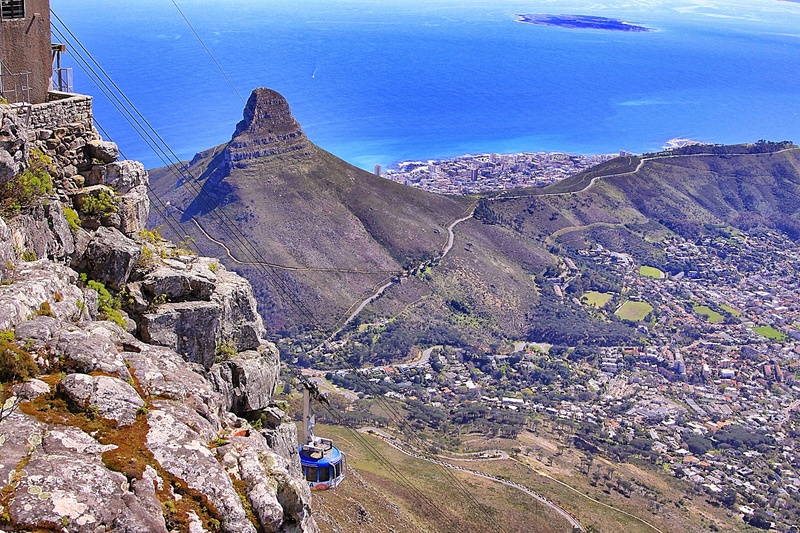 The small capsule we are standing in rotates as it ascends and this allows each of the passengers to get a stunning view of the city, Robben Island, the coastal plains and, of course, the imposing flat top mountain above us. The smooth ride to the top of Table Mountain takes around eight minutes – much shorter than hiking up (an alternative). Nearing the upper station you get a sensation of entering into the mountain. It feels like something out of a James Bond movie. We exit the upper station and walk out into the brisk temperature. We’re glad we bought out jackets with us. The mountain is over three thousand feet high and at this time of the year the temperatures can drop down to around 10 degrees C. However, the cloudless day is allowing the sun an unlimited opportunity to warm this part of planet earth so we won’t exactly freeze to death. It becomes immediately apparent that this is a very special place and it is easy to see why it is now one of the New7Wonders of Nature. We are looking forward to exploring this beautiful mountain top and soaking up the incredible views. The rather cold southerly breeze lets it’s presence be known as we start the steepish ascent of Cape Point. Nothing stands between southern Africa and the Antarctic so the wind is given free passage to where we stand. 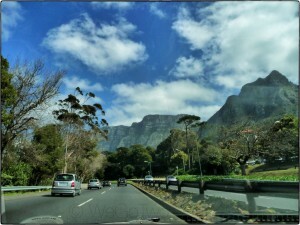 Below and to our right is the infamous Cape Of Good Hope, the feared yet welcome landmark to many sailors. 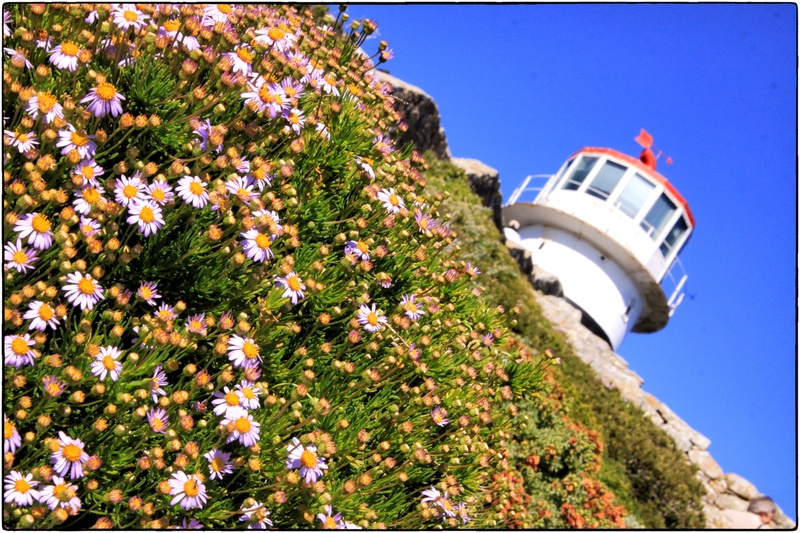 The Princess is enjoying the display of coastal flowers that line the pathway leading up to the lighthouse and I am enjoying the views one gets to take in from this rugged peninsular. Noisy seabirds dart across the sky above and below us – each of them on a mission. Thousands of birds nest on the cliffs that tower above the Atlantic coastline below. A precious piece of bird real estate. In the relatively warm waters of the bay below us several humpback whales are enjoying the last of their annual migration. No doubt the huge great white sharks that also call this bay their home are not too far away. 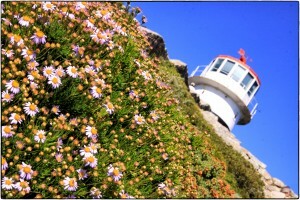 Cape Point – not the most southern part of Africa but certainly one of its best known landmarks. I do quite a bit of mountain bike riding here in Hong Kong and one of the places I love riding is the Chi Ma Wan peninsula. It is located on the same island that we live on (Lantau Island). The Princess has been keen to see where I ride so I suggested that we take a hike around the same track that I ride. So, with backpacks packed and plenty of water we set out today to explore Chi Ma Wan on foot. This morning’s weather did not look too favourable for a hike however not long after we rose it started to improve so we committed to the hike – rain or shine. Fortunately it turned out to be the latter. There are a number of ways to get to Chi Ma Wan (hiking, riding and ferry) but our chosen route was via the Discovery Bay (DB) to Mui Wo (MW) ferry then the coastal trail from Mui Wo. We always enjoy the ferry trip from DB to MW. We call it the slow boat to China – an old inter-island ferry the chugs along close to the shoreline. 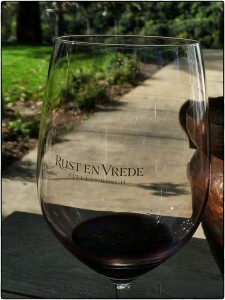 The staff are friendly and the open air upper deck is perfect for taking in the sights and temperature of the day. We departed DB around 1045 and arrived in MW less than 30 minutes later. The closer we got to MW the better the weather became and by the time we arrived the air was clearing and the sun was peeking through thin layer of overcast. Before setting out for Chi Ma Wan (CMW) we stocked up on some rations at Cafe Paradiso – some freshly made sandwiches on rye bread. This turned out to be a good move later in the hike when we stopped for lunch. They were delightful sandwiches! We set out for CMW around 11.20 – the short walk to the start of the trail taking us past a small beach at the back of the main street of Mui Wo. The coastal trail around to CMW is mostly concrete and it starts with a steep set of stairs that get the heart rate up straight away. The track follows the coastline of the southern shore of Lantau Island around to Chi Ma Wan and the views from the trail are stunning. You get to look back to Hong Kong island and south to some of the larger islands too. Whilst the trial is mostly concrete there are several stretches of clay base. After the recent rains the trail was muddy in patches but this didn’t stop us making good progress along the path. The one thing that was immediately apparent as we started out on the hike was that we were going to be in for a butterfly treat today. 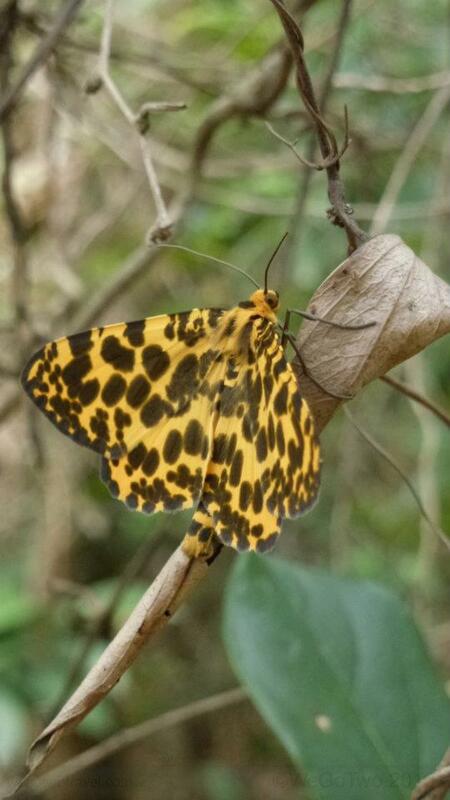 The spring temperatures have led to a huge increase in the number and type of butterflies and at times it felt like we were in a butterfly house. Absolutely beautiful. We arrived over at the CMW peninsula after an hour of walking and we enjoyed seeing the grazing “Lantau Cows” (the feral buffalo) that call this part of Lantau home. One has to be a little careful where one steps on the trail because these “locals” don’t have any toilet training and they seem to be quite happy to decorate the trail with their rather larges “pats”. The small beach leading into Shap Long Chung Hau (the small village the marks the beginning of the Chi Ma Wan area) is rather picturesque and, in some respects, set in an idyllic location. However, the locals that call this part of the world their home are not exactly environmentally savvy and the beach area is full of rubbish. It is a real shame that the culture here does not see anything wrong with having their backyard look like a rubbish tip (dump) – we guessed that it is going to take several more generations to wake up to looking after the environment a little better. Despite the proliferation of rubbish in village area we enjoyed the views of the surrounding areas (beaches, mountains and bushland) as we started the climb up toward the reservoir behind Shap Long Chung Hau. Before starting out on the next trail we walked passed two prison complexes and up toward a lovely reservoir that sits between two ridge lines – a beautiful watercourse that would be perfect for a “dip” in mid summer. After traversing the dam wall we headed up some steep steps and onto the Chi Ma Wan peninsular proper. Despite her recent bout of sickness (double pneumonia) The Princess handled the steps and gradients like a true pro and it wasn’t long before we were well into the Chi Ma Wan trail. Fortunately quite a bit of the trail is covered by reasonable overhangs so we were protected nicely from the increasing periods of sunlight. The shade also kept the temperature down as the afternoon progressed. Small creek crossings, rocky outcrops and stunning views to the southern islands of Hong Kong made for a very pleasant hiking along the well trodden (and ridden) trails. We enjoyed stopping periodically to take in the natural beauty of the area and to listen to the cacophony of insect “chatter” rising from the surrounding bush. We made good time along the trail however, around 1400 we decided to stop for a bite to eat – the lovely rye sandwiches we had made in Mui Wo. We chose a huge rocky outcrop just above Tai Long beach for our picnic spot. It was nice to stop and rest our legs and to take in the southern views across the Admasta Channel and toward Cheung Chau (a large island south of Lantau Island). The Admasta Channel is a rather busy waterway. It is the route taken by the many fast ferries that transit between Hong Kong and Macau. We enjoyed watching the continuous procession of hydrofoils and catamarans moving at high speed. We also enjoyed the company of two local black kites who kept a close eye on our lunch from overhead. These beautiful birds are very common here in Hong Kong and they enjoyed the ridge line thermals rising up from the coast below. 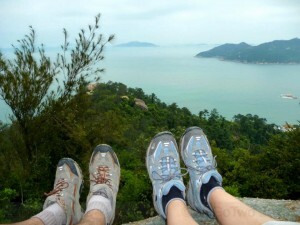 With our bodies refueled and energy levels topped up we continued our hike westward toward Pui O. The trail descends quite a ways on the western side (always a favourite part of the trail when I am mountain biking) so we had to be careful negotiating the steeper steps and washout parts of the trail – spraining an ankle is never a good thing when you are a little remote. For some reason (flower types?) the butterflies increased in numbers as we headed further west along the trail. We enjoyed photographing the more patient ones and taking in the sights on offer. Butterflies are a one of The Princess’ favourite so she was in her element. Indeed, I had to keep her moving (we’d still be out there if she had her choice!) along the trail. 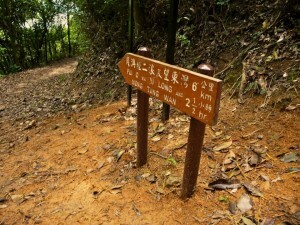 We left the main trail above Mong Tung Wan bay around 1500 and took a side trail toward Pui O. We had to be cautious of the slippery steps on the steep descent down to the Pui O trail however we managed to get to the bottom unscathed. 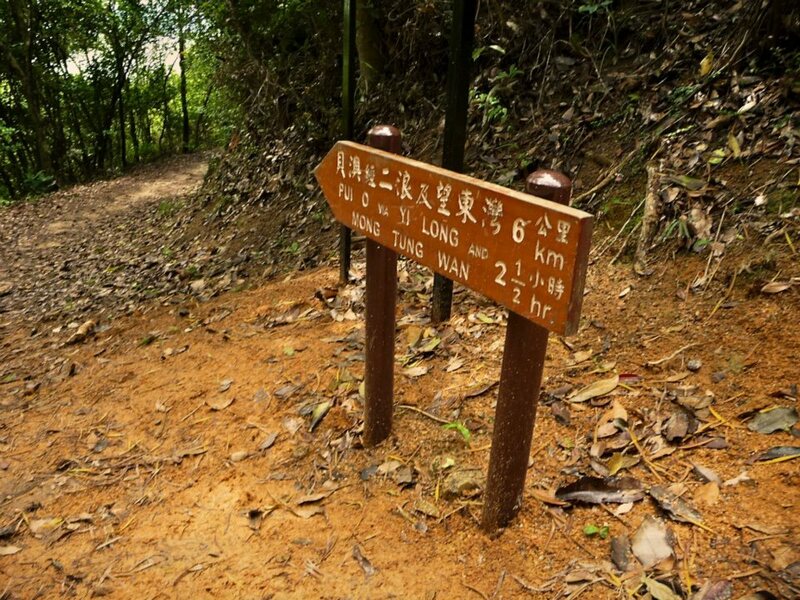 The trail around Mong Tung Wan to Pui O is concrete so the remainder of the hike was quite straightforward. We enjoyed the distant views toward Cheng Sha beach and the mountains of Lantau Island as we made our way along the pathway toward Ham Tin (the small village near Pui O). We arrived in Pui O around 1615 – just under 5 hours after departing Mui Wo. We were a little foot sore and tired after the 15km hike but happy to have made the effort. The Princess was very happy to have seen the trail that I frequent on my bike and very happy to have seen so many butterflies too! End note: It took us five hours to hike the trail and only 7 minutes in a bus from Pui O to Mui Wo!! Oh – the bus ride had nothing on the hike (other than the time element! ).